Luggage Carts Maneuver Easily In Elevators To Transport Heavy Materials For Hotels, Condos, Apartments And Office Buildings. 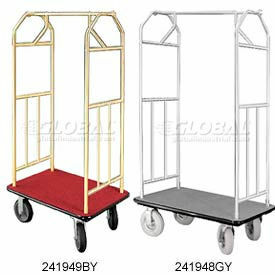 Luggage Carts are made with strong steel chassis and waterproof plywood deck covered in durable polypropylene closed loop carpet to complement décor and provide long lasting service. Solid black rubber bumper protects walls. 16 gauge x 1" diameter tubular uprights endure rough handling and feature a tarnish-proof finish or clear-coat finish for minimal maintenance. 71"H cart fits comfortably in hallways and elevators. Includes 2 disc hooks for items with straps. Luggage cart rolls smoothly on 2 swivel and 2 rigid casters. Easy assembly. Available load capacities are 800 and 1200 lbs. Tubular upright colors are Satin Aluminum and Satin Brass. Carpet colors are Black, Burgundy, and Gray.